Welcome to White Rock Tattoo! We first opened our doors in April of 2015. The shop is owned and operated by our two resident artists Mike and Travis, two good friends who have worked together for years and have more than 35 years of tattoo experience between them. With similar styles of tattooing they both enjoy doing soft black and grey work, but are willing and able to tattoo in many different styles, while always taking pride in doing, clean, solid tattoos. 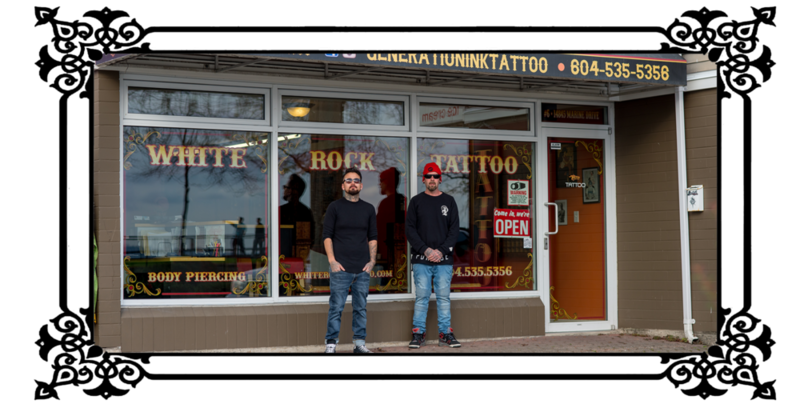 We are located on the beautiful west beach of White Rock British Columbia, Canada, where we strive to provide a warm welcoming atmosphere, where you can come, relax, get tattooed and have a great time! If you are interested in pursuing a tattoo project with us there is a super easy step by step process that you can take care of right here on our website! First, you’ll want to check our artists page, including their individual portfolios and bios. Looking over the different artists work and reading their bios will give you a good idea of what types of tattoos they most like to do and how they like to book their appointments. Once you’ve gotten to know the artists a little bit you can decide which one you think would be best for your tattoo. After you know which artist you would like, all you have to do is click on the “book a consult” link fill out the form at the bottom of the page and someone from the shop will get back to you asap! If you have any other questions there is a ton of information on the FAQ page, you can always call or text us at the shop at (604)-535-5356, or come in and say hi in person!